This week Jeff and Scott chat about the peculiar way the new Joker trailer made them feel -- you know, down there -- then they debate the merits and demerits of Jordan Peele's Us and ultimately decide it's the best Easter Bunny movie since the Rankin-Bass holiday classic Here Comes Peter Cottontail. Jeff remembers his mom's love of horror movies, while Scott recalls his Dickensian childhood reading crappy screenplays in a Victorian blacking factory, then they join hands and keep the lagomorph theme alive by plunging down a bottomless rabbit hole as they celebrate the joys and sorrows of dallying at the dollar theater. 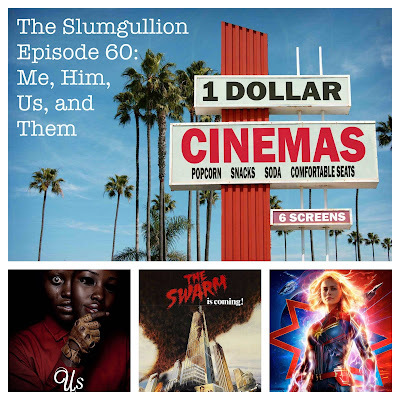 Finally, the entire New Movie Crew triumphantly returns to talk Captain Marvel, with many helpful tips on the care and feeding of Flerken. Now put on your anti-alien cat eye protection and let's hit PLAY!